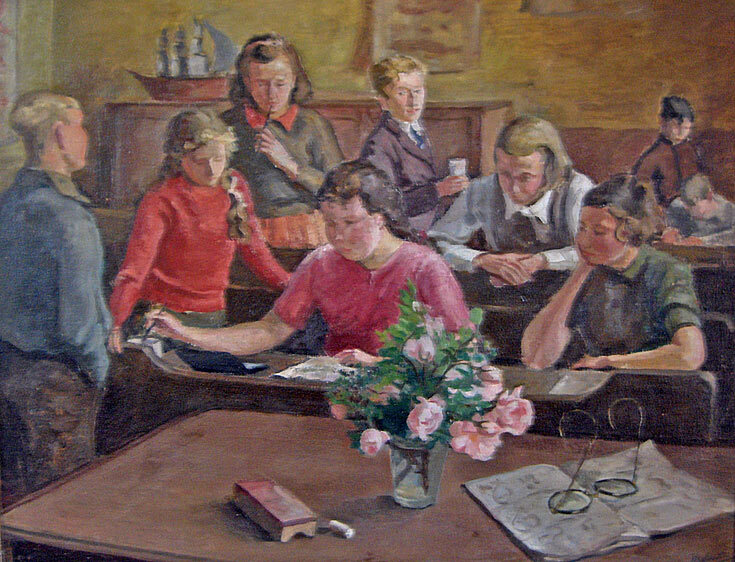 This is an oil painting done by a teacher at Cromarty School in the 1940's. Does anybody know the teacher's name? There is a signature but we can't read it properly. In this painting are Anne Mackay, Alistair Maclean, Bill Campbell, Walter Shepherd, Nancy? and not sure of the others. This painting was given to my mother (Helen Hogg (Couper) and we can't remember who gave it to her. Cromarty school had a cup which was contested by 3 teams, Britains the Celts and the Druids. What ever happened to it? The second person (in red) could be Evelyn Munro, and the one in the middle leaning forward (white blouse, next to Wonk,) could be Margaret McDonald (Alla's sister). That blackboard duster looks awful familiar, like the one Sandy Reid used to hurl. Ali Maclean, Ann Mackay, Marie Macphee, Walter Shepherd, Jean Fraser. At front is Nancy George and Isobel Macleod, behind is Jimmy Macivor. Not sure of the other person. Artist miss Meston or Hannan ? I have since discovered that the teacher was called Meta Meston. The painting is very good and of local interest. The other person is Bill Campbell, confirmed, and the artist Miss Meston. I think Helen got painting from Jessie Munro. Iris you are right. I have found out that the picture did come from Jessie Munro and that the teacher was called Meta Meston. We are running out of people who remember all these things. If anybody wants to see the painting, I am more than happy to show them it. See also picture 3147 by the same artist. That should have been picture 3103. Senior moment! Who do I send it to if I take a picture of it? Phil - my mother, Helen Hogg (nee Couper) was not a painter so not sure if you have the right person. Meta Meston was my art teacher at Kaimhill secondary school in Aberdeen in the early 70's. She lived in Stonehaven and was a well known respected local artist. There is a memorial stained glass window to her in Dunotter Kirk Stonehaven.I remember her well.